With a sleek, concealed design and white push button, the wall-mounted Aria toilet from Foremost is the perfect stylish addition to the modern home. The Aria comes as a complete concealed, insulated tank, toilet bowl, and 2' x 4' in-wall adjustable carrier system. 6.0LPF/1.6GPF or 3.0LPF/0.8GPF with wash down flush action, the Aria is MaP certified at 600g and comes complete with a smooth close & quick removal seat with added scratch resistant and anti-UV features. This Glacier Bay 2-piece all-in-one concealed toilet with modern style will make your bathroom look clean and tidy. The toilet has a 16.5 inch bowl height from floor to the top of the bowl rim. Features of this toilet include a quick release and soft close seat cover, anti-siphon quiet refill valve, siphon jet flush, 3 inch diameter flapper, a lined tank, and a 12" rough-in. The water supply line is not included. The innovative design of the Icera Cadence toilet features sleek lines and smooth contours that infuse high-end style to virtually any dicor. The compact 27.5inch bowl of the new Cadence one-piece toilet creates a subtle profile in the bath with a shorter front-to-back dimension than most round front toilets on the market. Santa Rosa 1-Piece 1.6 Gpf Compact Elongated Toilet With Aquapiston Flush Technology In White The Santa Rosa Comfort Height 1-pc compact elongated 1.6 gpf toilet offers the exceptional functionality you expect from Kohler in a smaller footprint, so you can transform even the smallest of bathrooms into a well-designed, comfortable space. 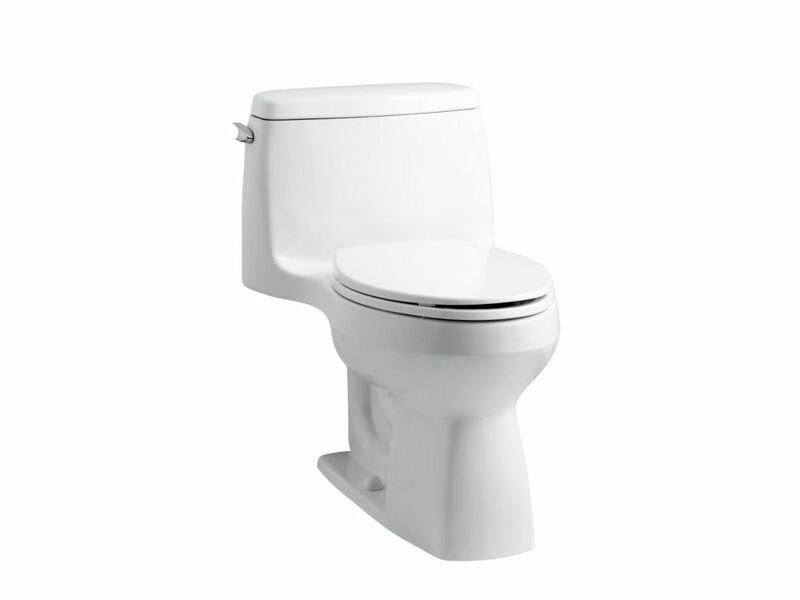 Santa Rosa 1-Piece 1.6 Gpf Compact Elongated Toilet With Aquapiston Flush Technology In White is rated 4.3 out of 5 by 238. Rated 5 out of 5 by Robert from Very nice. I like it.... Very nice. I like it. Rated 5 out of 5 by Daniel from Perfect, installed and work just as they should.... Perfect, installed and work just as they should. Rated 1 out of 5 by Anthony from POOR QUALITY WORK AT THE TOP OF THE TANK NO... POOR QUALITY WORK AT THE TOP OF THE TANK NO GLAZE ON THE EDGE WHERE THE LID GOES THE LID DOES NOT COVER AT UP . MAYBE YOU NEED BETTER QC ? PS LOOK FOR YOUR SELF TONY C.
Rated 4 out of 5 by chuck from Would be 5 star if not too tall. Comfort height is not for those with short legs, mine being 30",... Would be 5 star if not too tall. Comfort height is not for those with short legs, mine being 30", are a bit too short making the back of my thighs hurt. I will move it to my second bath and replace it with a normal height. All considered, still a great purchase. It doesn't just flush, it devours whats in it.